This 1 hour party package is aimed at younger children. Fun Figurine Parties (Blue Zone, except mugs) cost £9 per person, each child gets to choose from our collection of smaller figurines including cats, dogs, dragons, snails, penguins, pirates, rabbits, racing cars, foxes, squirrels, fish, turtles, unicorns, teddy bears and lots lots more. Fab Figurines Parties (Green Zone, except mugs, plates) cost £12 per person, each child gets to choose from our collection of larger figurines, boxes, lots lots more. Money Box Parties cost £14 per person, each child chooses from our selection of amazing money boxes, including footballs, monster trucks, princesses, castles, whales, dolphins, frogs, piggies, horses, Octopus, burger, stegosaurus and so many more. 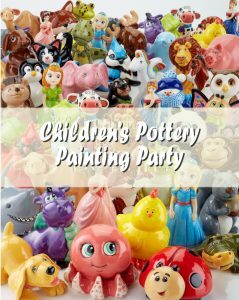 Acrylic pottery painting parties are suitable for children from 3 – 10 years. Please remember to tell your guests that this is a messy party and to wear suitable clothing as paints can stain.